Run your first 5k or learn to run for fitness. This 5K training group is designed to introduce people of any age and fitness level to endurance running. This 5k running group is also suitable for re-introducing people to running who may have been away from the sport for awhile, or a runner who is returning from an injury. This group is also for people who simply want to run for fitness. Not sure you can handle this group? If you can run or jog for 1 minute and walk briskly for 30 minutes total, this group is for you. We will build you up from there. Worried that you are too slow to run in this group? Everyone in the group runs their own pace during the “run” interval, but the rule is the group reforms to walk together during “walk” interval. Everyone gets to run their own pace, nobody holds anyone up and nobody gets left behind. The “run” interval is performed at conversation pace. If you are breathing so hard you can’t speak while running, our coaches will slow you down. We are here to teach you to endurance running – not sprinting – and that starts with proper pace. We exclusively teach the run/walk interval method in this group. The run/walk method allows your body to adapt to new levels of exercise. Runners will need to perform two additional “Honor Runs” during the week on their own using the run/walk intervals prescribed for that week. Each group run kicks off with an instructional session teaching basic running concepts from types of stretching, to running dynamics, form, hydration and nutrition. Program is 12 weeks culminating in goal race. The 5k group registration price includes the goal race entry fee. At the end of the training session, you are prepared to transition to the 10k training program, if going farther is your goal. This group usually has three sessions, fall, winter and spring. 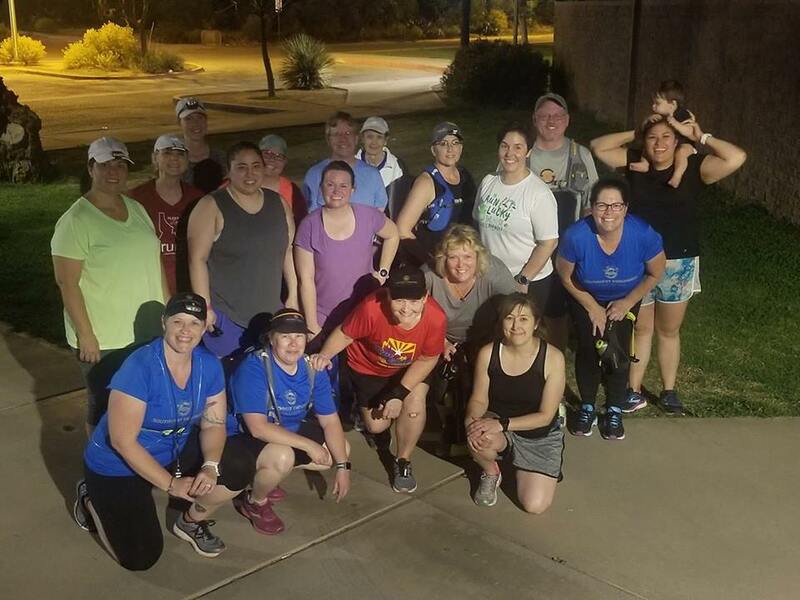 5K training groups have two locations. East and Northwest Tucson. The Northwest training group supports runners in the Northwest Tucson, Oro Valley and Marana areas. You won’t get bored running in the same place every time because our groups meet in a variety of locations. Not sure this program is for you? We offer a free, two-week trial on all our training groups.